At some point, every Christian encounters the trials and deep mysteries of the Christian faith. And when that happens they become a thirsty traveler; what hey most desire is hope, comfort, and encouragement to burst forth like a sparkling, clear river. 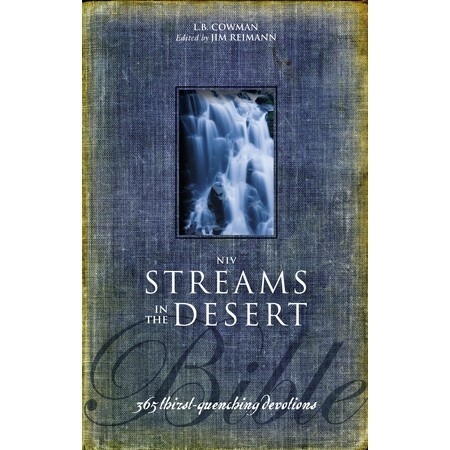 The hopeful daily readings in the NIV Streams in the Desert Bible promise to revive and refresh today's generation of faithful sojourners by providing daily devotions in modern, easy-to-understand language that beautifully captures the timeless essence of the original. These devotionals are presented alongside Scripture using the popular New International Version of the Bible, and this hardcover edition will be a lasting, elegant resource. While the devotions in this Bible were originally written by L. B. Cowman-a pioneer missionary in Japan and China from 1901 to 1917-this devotional Bible has been edited by James Reimann. It maintains the beauty of the original Cowman writings while making the devotionals more accessible for the readers of today. Honestly, I could not believe how beautiful this bible is when I received it. It is sturdy and easy to navigate. While the print was a little small for my poor eyes, a magnifier fixed me up nicely. The devotionals are perfectly interspersed within, to be relevant to what you are reading in the scripture each day. This means that if you wish, you can combine the devotionals with a daily bible reading simply by reading from one devotional to the next. You will finish the bible in a year and have thought-provoking study, to boot! Each devotional is designed to give hope and good news to weary readers. I have really been wanting a devotional, friend, and this sounds lovely. No matter what, thanks for your heart to share by giving a copy away. Love you so much. Beth+S. recently posted...Three Word Wednesday: Why the Military? Heather+@+My+Overflowing+Cup recently posted...An Announcement and A Gift For You! Dolly@Soulstops recently posted...What if you stopped trying to be an extrovert? So excited to check out this book, Shelly! Thanks for sharing it with #EverydayJesus.